Ataccama Master Data Center v10.2 is a multi-domain master data management tool that is robust, scalable with high performance, and offers full data quality. It has advanced hierarchy management capabilities, and strong matching and identity management capabilities. It is cloud (Amazon Web Services) ready; and real-time, streaming and batch ready. Caveats are nascent product information management capability and business process management integration. DataGenic is the leading global provider of on-premise and in-cloud Smart Commodity Data Management software, delivering intelligent analytics, real-time data content and proven business value. 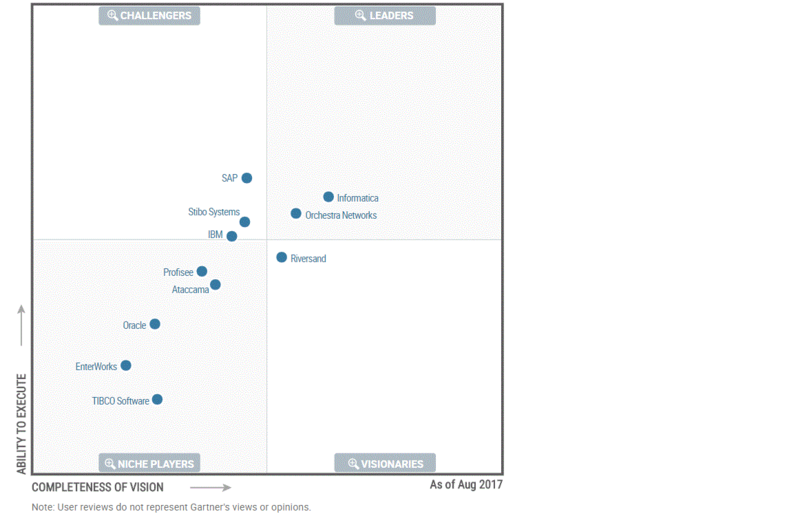 Recognized as a leader by top analyst firms, Dell Boomi integration platform as a service (iPaaS) is 100 percent native cloud. It’s a shared-everything, multi-tenant platform that supports cloud-to-cloud, SaaS-to-SaaS, cloud-to-on-premises, on-premises-to-on-premises and B2B integration. Dell Boomi AtomSphere supports real-time integration and elastically scales to meet high-volume needs in mobile, batch (ETL) and EDI environments. Easily accessed via a browser, it delivers an impressive range of integration, master data management (MDM) and platform extension capabilities. EBX5 is a master data management platform that provides master data customers, products and reference data throughout your enterprise for operational and analytical processes. Orchestra Networks EBX v5.6 integrated master data management, master data governance, and relationship data management all in one product. It features a number of new capabilities, including graph visualizations, data quality dashboards, business glossary and metadata governance, and other data assets. It features multi-domain OOTB, which provides automatic synchronization with cross-domain links between party, thing, and reference data; and it provides strong hierarchy management.
" Имейте в виду, если вы сделаете быстро и плохо, то люди забудут, что вы сделали быстро, и запомнят, что вы сделали плохо. Если вы сделаете медленно и хорошо, то люди забудут, что вы сделали медленно, и запомнят, что вы сделали хорошо! " " Не нравится - критикуй, критикуешь - предлагай, предлагаешь - делай, делаешь - отвечай! " " Работать для науки и для общих идей – это-то и есть личное счастье. " " Никогда не рано спросить себя: делом я занимаюсь или пустяками? " " Всё, что важно, не бывает срочно. Всё, что срочно - только суета. "